How bad is your data - and is it fixable? Datamine Partner Matt Wilkins has spent a decade helping organisations get more value from their data, and he often meets with companies that are uncertain about jumping into analytics due to the state of their data. Here's his take on the issue of data hygiene and its relationship with analytics. I really love the feeling that comes after giving the house a good clean – there’s something so intrinsically satisfying about knowing everything is tidy and in the right place. And on the other hand, there is something weirdly unsettling about having clutter everywhere, not being able to find things you need and watching the mess build and build out of control. What data do I need to clean in order to do 'X'? Instead of taking either of these approaches, you need to work backwards, focusing first on where your business will see the most value from analytics. From there, you can determine what data must be cleaned and organised to enable those specific value-adding analytics projects. Honing in on very clear use cases for any data hygiene projects allows you to carve off and capture pockets of value over time, making measurable headway without getting overwhelmed or wasting time and resource. For example, let’s say your ideal commercial outcome is to improve marketing ROI. In order to do this, you need to have a better understanding of your customers - who they are, how they behave, what they want from you. And in order to get this understanding, you need to analyse demographic and transactional data. So for the time being, put aside the rest of the mess and focus all efforts on cleaning the data you need right now. How do I actually go about getting my data into better shape? This is a two-part process. 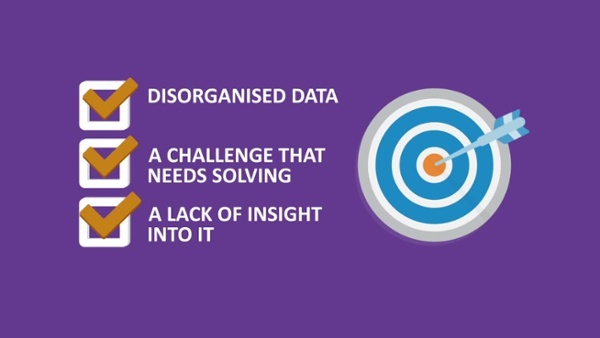 Once you’ve identified a section of data that you need cleaned in order to begin a value-adding analytics project, there’s then the challenge of actually doing that cleaning – something that is unfamiliar territory for many organisations (even ones with capable IT teams). I typically recommend an external data audit in the context of the objectives your business wants to achieve, as a third-party expert will likely be able to better (and more quickly) get your data into a digestible and usable format than your internal team will. The second part of the process is investing in the long-term health of your data. At some point, you’ll need to apply some thinking around why the data is messy in the first place and move the focus to the systematic root of the problem – otherwise you’ll just continue cleaning up different pockets of data as they’re perpetually created. In order to do this, you’ll need to get an understanding of where and why the data is becoming messy, as well as a solution for improving this moving forward. One of the best ways to identify, clean and isolate the data you need for specific commercial objectives is through the use of a datamart. These data repositories exist to overcome many of the typical hygiene issues that cause large databases and warehouses to become so messy. As you can imagine, it’s difficult to fix data issues in a large operational system (e.g. a PoS or underwriting system), but it’s easy to clean the data you need and move it into a separate datamart where it can be added to other cleaned, relevant data. Click here if you’re keen to chat with me or another one of our data experts about any of the above solutions we offer. Data governance: It's more than just risk management. We have NZ fuel price data, and so could you. Here's what you need to know. Imagine if you could move beyond guesswork to address your most important business problems. With over 20 years’ experience, Datamine is a leading analytics consultancy dedicated to connecting and empowering people to benefit from data analytics every day. Our team creates addictive analytics experiences with a focus on collaboration, innovation and pragmatic excellence - if you're ready to unlock the value in your data, we’re ready to help. Looking for something more in-depth?